Andy started his career with Corby Town, before spending a couple of seasons with Wellingborough Town in the late-1980’s. 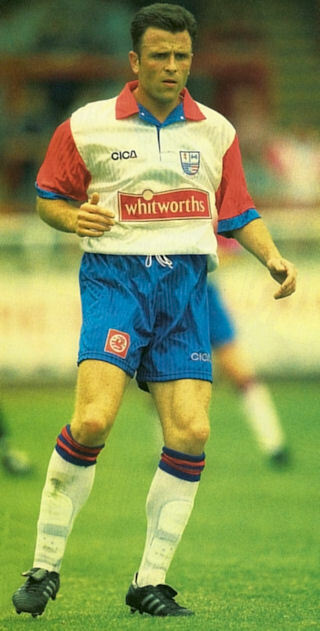 He joined Rushden Town, and was one of a number of players to transfer to the new club in the summer of 1992. 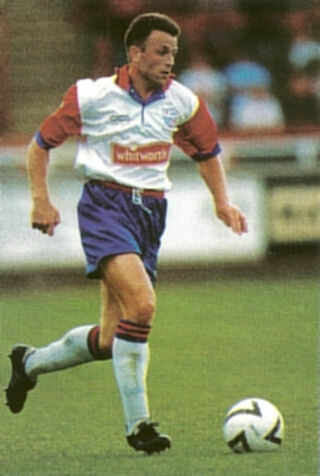 Playing mainly as a winger / striker, Andy was very much a utility player and he made his debut for the new club in their first FA Cup game defeat, at Hednesford. He scored the first Diamonds hat-trick – against Evesham, as he broke his duck in the league for the club. He worked as a warehouse manager and remained with the club as they gained promotion into the Conference via the Southern League Premier Division. During the first season in the Conference however, his opportunities were limited to just seven League substitute appearances and an offer of £4,500 from Gloucester City in October 1996 was accepted. He spent just a single season at Gloucester making 25 appearances for them, before moving back to Northamptonshire with Rothwell Town in July 1997, for whom he captained the side. He moved to Raunds Town at the start of the following season, but moved Nuneaton Borough in December 1998. He was released again in May 1999, and joined Cambridge City briefly before returning to Rothwell Town. He had another spell at Cambridge City, where he took up the role of caretaker manager before becoming assistant to David Batch, but both were dismissed in December 2002. He then retired from the football scene.